Home / News / Popeye / Yoe Books Presents Popeye, coming in September! 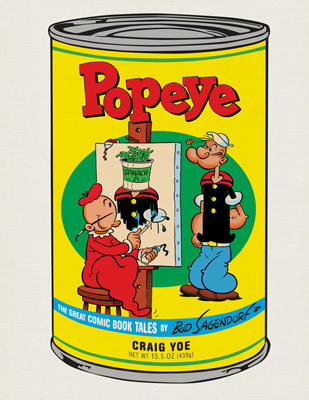 Yoe Books Presents Popeye, coming in September! There are three genius incarnations of Popeye, the comic strip by E.C. Segar, the animations by Max Fleischer, and-unknown to many-the brilliant 1940s and ’50s comic book stories by Bud Sagendorf! Comics historian Craig Yoe collects and beautifully packages the best of the best of Sagendorf’s thrilling and roll-on-the-floor laughing tales. See the Sea Hag, Bluto, and, of course, Olive Oyl, Wimpy, and Sweepea join Popeye in exciting adventures-and brilliant comic book stories. Sagendorf worked as Popeye’s creator Segar for many years, learning all the craft, soaking in the zaniness and the uniqueness that is the One-eyed Sailor. Sagendorf penned these tales with love and skill-even adding some of his own unique characters.